Are your savings going backwards? Have you ever thought you were doing something good for yourself only to find out it was having the reverse effect? Like having a caffeine-hit only to end up in an even bigger slump, or dry-cleaning that expensive jacket and having it returned ruined. Unfortunately the same can be said for many Australians who keep their savings in a high-interest bank account. If the prices of the things you want are rising faster than the interest you’re receiving, you’re actually going backwards. This situation is now common for many Australians because interest rates have fallen to a historic low and are now below the rate of inflation. This means that each year you’ll be able to buy less stuff with the same money than you could the year before. Interest rates have been declining steadily over the last few years which means most of us are getting less interest on the money we keep in our savings accounts. The interest rate offered by 2 of the most popular online high-interest accounts have dropped from almost 6.5% p.a. in 2010 to below 3.5% p.a. today (providing you meet their extra terms and conditions). Rates include bonus offers where terms and conditions with the providers are met, such as minimum monthly deposits and having a linked savings account. For most term deposits or saving accounts without these additional conditions, the interest rates on offer are well below 3% today. So whether you are saving to buy a property, or you’re in retirement who depends on bank interest to draw an income, the recent reduction in cash rates has probably squeezed your financial situation and pushed you further away from reaching your goals. Meanwhile consumer prices have continued rising – from housing to healthcare, or even the cost of a coffee. For your money to be worth at least the same amount at the end of the year as it is today, you need to be earning a return that’s higher than the rate at which prices have been rising. Let’s look at an example: if you earn 2.25% interest from your bank (the average amount offered today according to YieldReport) and the inflation rate is 2.3% as it was in 2014, the real rate of return on your money is actually -0.05%. This means you’re pedaling backwards. And that’s before factoring in taxes on your interest earned. If you fall into the most common marginal tax rate of 34.5%, you need to be earning an interest rate of 3.81% just to maintain the value of your savings at the end of the year. And if you’re in the next tax bracket of 37%, the required return increases to 3.95% just to maintain the value of your savings. 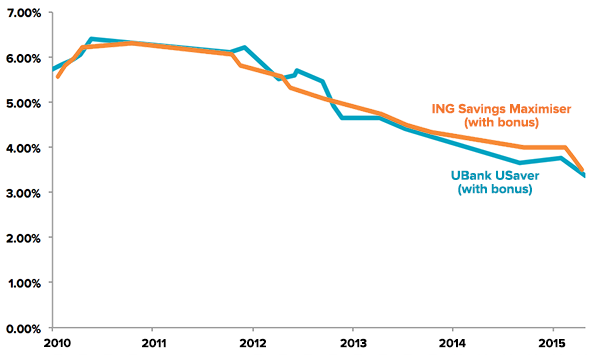 Not many banks are offering interest rates above 3.81% these days so most people with bank savings are now losing out. But don’t panic, there are other options to help you stay ahead. Investing in a broad portfolio of shares and bonds over a long period has been proven to be one of the best ways to beat inflation. Over the 10 years to December 2013, Australian shares produced a total return of 9.20% p.a. which was well ahead of bank interest after factoring in taxes. The after-tax return to investors on the lowest marginal tax rate was even higher at 9.40% p.a. as a result of tax benefits like franking credits that are available to investors in shares. Investing can be a riskier option in the short-term than leaving your money in the bank because investments can go up or down on a day-to-day basis. However by diversifying your portfolio (i.e. having a mixture of investments that compliment one another) you can reduce that risk significantly compared to picking individual shares. Exchange traded funds (ETFs), like those offered by Stockspot, are a good option for those wanting an alternative to cash in the bank because they are a low cost and easy way to get exposure to hundreds of companies. Whilst investing can be a good option, we do think it’s important to keep some money in the bank for a ‘rainy day’. This is to ensure necessary funds are available to access if you ever need to cover unexpected medical costs or expenses between jobs. We recommend having 6 months worth of expenses in a savings account before considering any investment. By having a good mix between cash savings and longer-term investments, you’re better armed to ensure your funds are working hard for you, rather than have them going backward. Stockspot is Australia's first online, automated investment adviser and fund manager. Access a portfolio of ASX / Global Shares and Bonds without the high fees.